It didn’t take much to push me. 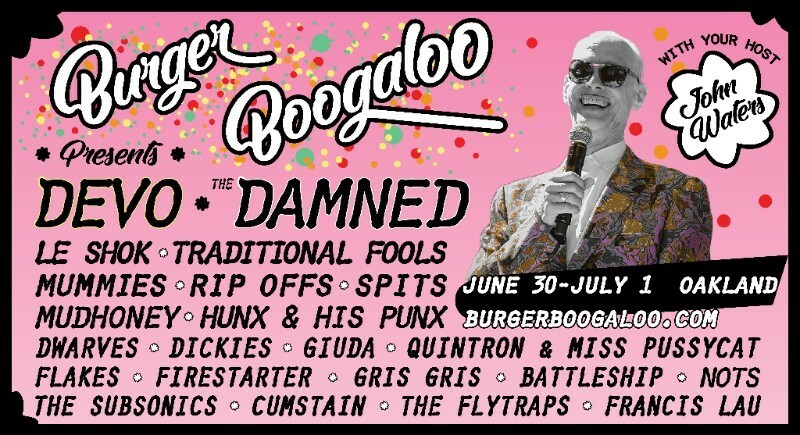 Especially after seeing images and reading about Burger Records‘ yearly festival Burger Boogaloo for several years. When it comes to music festivals, pretty much everyone I know is unanimous in skipping the hassle of the big organized festivals. While my own tastes seemed to follow groups that have traditionally played in tiny clubs or smaller venues, it was only recently the phenomena known as the “reunion” shows has forced me to slightly reassess that preference. Normally, I doubt anyone can pass up seeing a favorite group one more time, but that dedication is sorely tested once you have to do it alongside 25,000 people. Garage music in general has never really translated well to these settings. Not too much money to be made from 100-person festivals in 1985! However, that was just in the U.S. Not so oddly, our friends across the Atlantic thought differently. 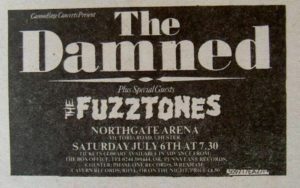 Bands like The Headless Horsemen and The Fuzztones, both of whom regularly played to crowds of 50–100 people in NYC, were invited to play huge European festivals. Even more impressively, on bills that drew tens of thousands of people. And while the U.S. “alternative” festivals eventually caught on in the early 90s and attracted some amazing talent though the years, garage punk really wasn’t what brought the masses. That all changed with the unlikeliest of people. Poster for Little Steven’s Festival. But, I digress. I’ll cover this event in further detail a future column. It truly deserves its own post. 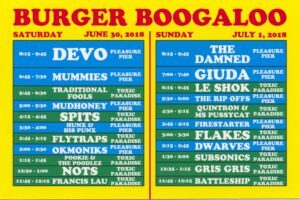 For now let me just say that, at that time, the idea of a “good” punk festival that did not put promoters in hock and did not fall into the trap of becoming this unstoppable merchandise-fueled juggernaut seemed difficult to impossible. Since then, thankfully, things have changed. Many other mavericks have organized smaller garage music festivals both here and overseas to much more success. This year’s festival did not disappoint. Quite amazing considering that the previous years headliners were original punks, The Buzzcocks, Iggy Pop, X and Redd Kross. Mighty big Docs to fill if you ask me. 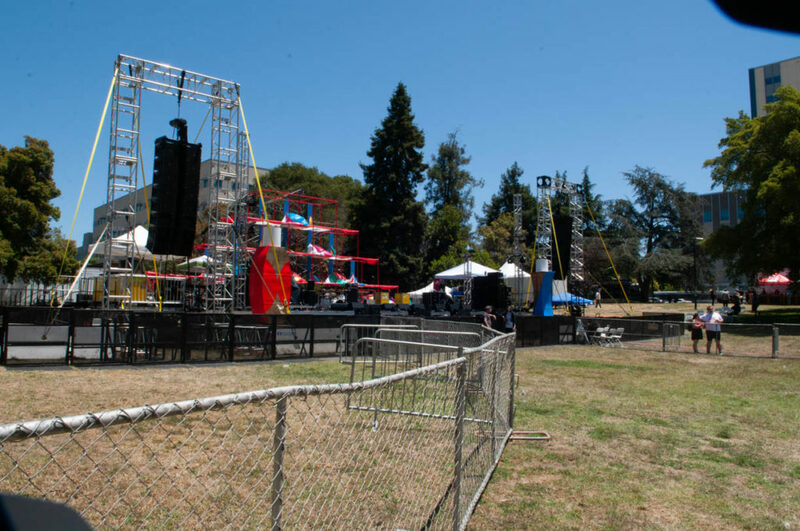 The location was, as it was in the previous year, Mosswood Park, one of the smaller city parks in Oakland. Many pointed out to me that the city has changed quite a bit, but still it runs into the same issues that many urban areas have to grapple with. Unfortunately, in this case, this meant moving some homeless encampments out of the park for the weekend. Something which caused a bit of a stir in the news. To sooth the critical attention, festival goers were encouraged to donate to the homeless organizations in attendance at the festival. Certainly a worthwhile endeavor. The Pleasure Pier stage in the early AM. The two main staging areas for the acts, The Toxic Paradise stage and the larger Pleasure Pier, were on opposite sides of the park. While in between you had your usual festival staples such as veg and non-veg food options, vendors and the ubiquitous porta potties. What it didn’t have was massive amounts of humanity. Food and drink were easily obtained and even the bathroom lines were pretty reasonable. People were generally in a good mood, and even seeing entire families in attendance made me think this was just a typical weekend outing—that happened to have live music. Without going through the entire lineup, I’ll jut say that the experience was a fantastic one and every single person in the place, both onstage and off, seemed genuinely happy to be there. That was even obvious during the sets of the few harder punk bands. No scuffles, no one was hurt and once the group finished…you just saw smiling people leaving the area. Band highlights? Where to begin. 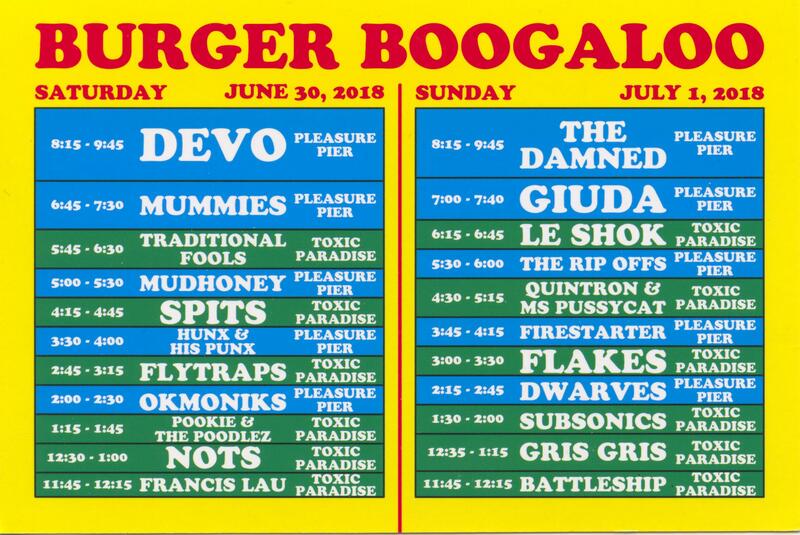 Personal favorites were of course The Mummies (who pretty much have never done a bad show in their existence) as well as garage trash punks Traditional Fools, Italian glam rockers Giuda, SF’s Flakes, and Japan’s pop punks Firestarter. As the last chords of Sensible’s guitar (on Jello Biafra no less) faded into the cold, humid Oakland night, it was hard not to feel a vicarious sense of accomplishment for everyone involved in the project. No bones about it, this was a difficult thing to do. And the fact that it appeared so easy on the surface just reinforced that hard fact. Many thanks to David Greenfield, Greg Gutzbehal, Aya Cuzner, Jim DeLuca, Real Boss Hoss, Laurent and Sunny, Lisa and Suke and the myriad of folks and bands who made my time spent in California pretty damned Neat, Neat, Neat.